This post will cover how to deploy a Python Website to Azure Web Apps for Linux using python. With the release of Web Apps for Linux it makes it easier to deploy any application to Azure Web Apps. Before Web Apps for Linux there needed to be explicit support for a language in Azure or you had to create a complicated Kudo Extention to enable a language. For many languages, it also means you need to use the Windows specific distribution which often had issues with 3rd party libraries not supporting windows (although this is getting better now). This tutorial will walk you through how to create your first Python Flask Website but if you already have an existing Python website (either Flask, Django or any other framework) you can skip to the step where you Add a Dockerfile. I assume you have Python and Docker installed. If you’re looking for complete samples, here is the Flask Example from this tutorial and Django example. I will use Flask in this example but you could use Django or any other python web framework you would like. return "Hello from an Azure Web App running on Linux!" This creates a simple Flask site with one route that displays a simple hello world message. You can learn more about Flask at the Flask Website. Note: app.run() passes a argument called host with a value of 0.0.0.0. This is important for working with Docker. You can learn more about it in this stackoverflow answer. This will be used by Pip to install the Flask Library. If you navigate to localhost:5000 you will see your new website. Congrats you just created your first Flask app! The first step to getting your app ready to run Azure Web App for Linux using Docker is to add a Docker File. When I was creating this tutorial I found a great plug-in for Visual Studio Code that makes working with Docker easy from VS Code. If your using VS Code I would recommend checking it out. This Dockerfile uses the official Python Base image. The Dockerfile then creates a folder code and copies all the files from the current directory into the docker image. Next, it runs pip which installs all the library dependencies from the requirements file (in the case of this tutorial that would just be Flask). It opens the port and finally runs the command that launches the website. You can find the specific command to launch your app in your framework documentation. Note: With Django, we are again binding the app to the 0.0.0.0 IP address so that it can be exposed to the outside world through docker. This is slightly different location than we are doing with the binding in the case of Flask. docker build -f Dockerfile -t flaskwebapp:latest . This will download the Python base docker image (if not already local), perform the actions in your Dockerfile (copy the files/run pip/etc) and then tag the new docker image as flaskwebapp. You can now navigate to localhost:5000 and you should see your Flask App running inside a docker container. 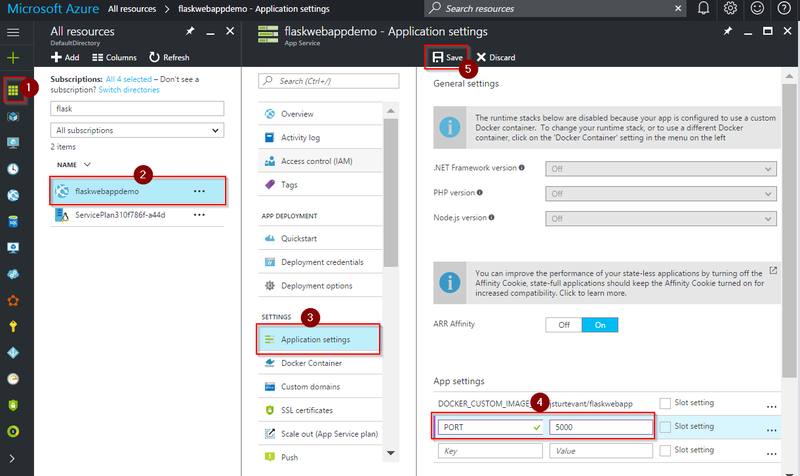 The next step is to publish your docker image to a location where Azure Web Apps can pull the image to use inside Azure Web App environment. If your app is open source then you can host it in the public Docker Hub, which is what will do for this tutorial. Otherwise, there are many options for hosting a private Docker image such as Docker Hub or Azure Container Service. To publish it to Docker Hub make sure you have already signed up for an account. Next, Click Create, fill in the app name, subscription, resource group and App Service as in the image below. When you get to the Configure Container Section click on it to open a new blade. You then have the option to use a preconfigured image, Docker Hub, or private Registry. In this example, we will choose Docker Hub and then fill in the image name with the docker image name we just pushed in the previous step (in my case jsturtevant/flaskwebapp). Click Ok and then Create. Azure will then create the Web App for Linux using your custom image! We are not completely finished though because we need to configure Azure to use port 5000 that we specified in our Dockerfile. Once the Web App is published we can navigate to the Web App dashboard by clicking on All Resources, Selecting the Web App you just created, then Clicking on AppSettings. Once you are in the Application Settings blade you can add an App Setting key of PORT with a value of 5000. Click Save at the top. Note: If you need to set environment variables for your application this is also where you set them. Azure will take care of passing the environment variables through to your docker container. Now you can navigate to your new Azure Web App (http://yourappname.azurewebsites.net/) and see your project! 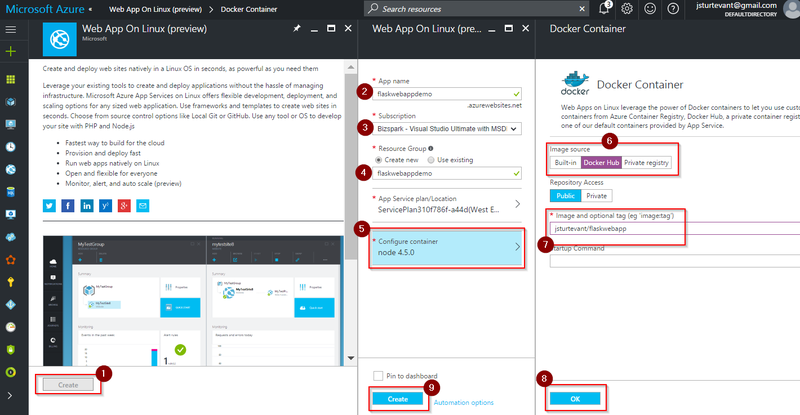 In this tutorial, we created a new Flask Web app, added a Dockerfile and then deployed the built image to an Azure Web App for Linux. Although this tutorial was for Flask, you could easily make a few changes for your favorite python framework. And the same basic principles would work for any language (node.js/Go/Elixir/etc.). You can see a complete Flask example from this tutorial and Django example here.